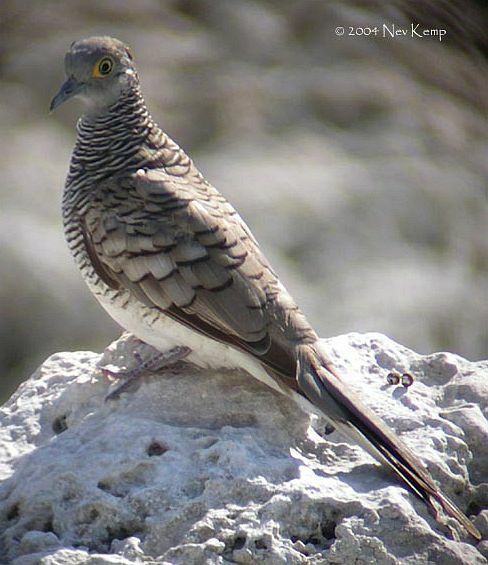 A page on the genus Geopelia is included here because it was felt that those who keep diamond doves would be interested in the characteristics of the other species in the genus. The five doves in this genus are all similar in that they are small or very small, with long tails, and have either barred or spotted plumage. The five species can be divided into three groups according to their physical appearance. First there is the diamond dove which has a spotted plumage while the other four species have barred plumage. Then the bar shouldered dove is considerably larger than the other four species having a weight in excess of 110 grams while the other four species have a weight between 20 and 70 grams. The three remaining species, the zebra dove, the barred dove, and the peaceful dove are very similar. The barred dove is distinct from the Peaceful Dove and the Zebra Dove in that it has yellow colored skin around the eyes. The Peaceful Dove and the Zebra Dove both have blue skin around the eyes. It should be noted that in 1992 R.E Johnstone included all three of these doves as races of a widespread species. Gibbs followed White and Bruce's narrower species definition in their 1986 book. It is probably worthwhile to understand how the scientific names of the Geopelias have evolved as the old and new scientific and common names can be found throughout the literature especially when searching the internet. 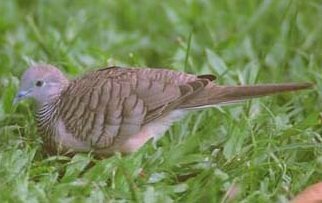 On many Australian internet sites, the peaceful dove is still given the scientific name G. striata and the common name "barred dove" any be applied to G. placida, G. striata, as well as G. maugei. Goodwin stated that the Australian forms are paler than the Indo Malayan forms and this seems to be born out by the photos included here. But he did indicate that these forms had barring across the front and sides of the breast. He did not distinguish between the differences of the three Australian forms. He said the Lesser Sunda Islands form is darker than the others and the entire breast is strongly barred. 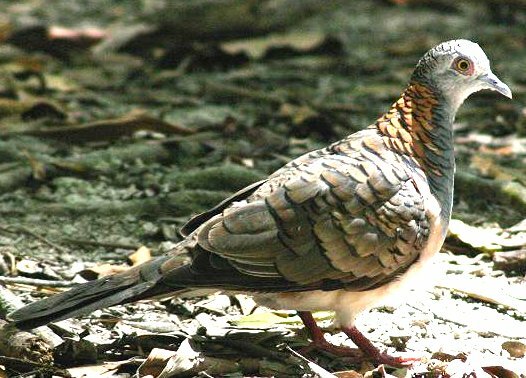 The bar shouldered dove was not included in the 1969 edition of Pigeons and Doves of the World but did appear in the 1983 edition. G. striata tranquilla and G. striata clelandi were named as subspecies under G. placida along with a new subspecies G. placida papua. Distinguishing characteristics for each subspecies are so slight that no attempt will be made to list them here. In the Gibbs, Barnes, and Cox book they are described as geographic variations. All of these species inhabit the relative open and dry savannahs and other semi arid regions. 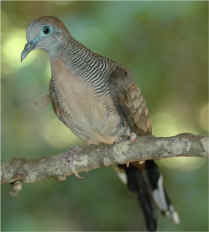 The zebra dove and the peaceful dove often inhabit urban areas and other man altered areas. 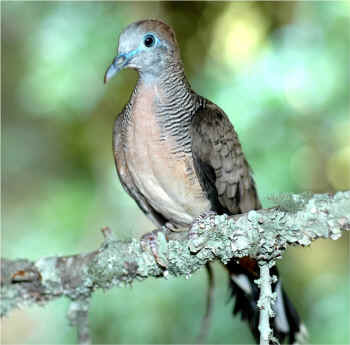 The larger bar shouldered dove prefers wetter habitats than the other four species. Photo credits are at the bottom of the page. Permission to use any of the photographs here must be obtained from the photographer.